People shop in big box stores because they want to get more for their dollar which can include buying in bulk. So it makes sense that good placement of club packs will entice shoppers to put a few more items in their cart before they reach the checkout line. The question becomes how you define “good placement” and the answer can vary based on the product, the store layout and customer trends. However, there are some standard placement methods for club packs that can work well in almost every situation. 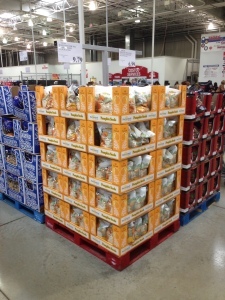 Many store managers create large “aisles” of club packs at or near the front of the store close to where the checkout lines will form, displaying them on low-profile shelving and pallet drops. The rationale is that customer will walk between those rows of club packs and take the final opportunity to load their carts as they head to the cashier. In reality, however, this works even when a customer is still working their way through the store. If the club packs are perpendicular to the main aisles, a customer can choose to pick up the product pretty much anytime during their shopping trip as they pass along the front of the store from one aisle to the next. By default, this is near the front entrance and checkout areas of the store, but there may be other high-traffic areas that work for club pack content. A manager who is in tune with his or her store will know where these areas are or how to create them with a special sale or other offer that pulls customers to that section of the store. A good option for smaller stores is to work the warehouse club packaging into the aisles near similar products that are not packaged in bulk. This can make it easier for customers to compare costs and hopefully see the savings of buying in large quantities rather than in ones and twos of the same products. However, this means having to clear out other items to make room for the club packs. Larger stores have the option of creating a separate space for all products in club packs. It removes the ability to compare prices, but the reasoning is that consumers who shop in this area are already convinced of the value they get from buying in large quantities. If the store manager knows this about the customers, then this set-up makes sense. Having the club packs in their own areas also allows you to put a bit more pizzazz into the marketing materials that will attract people to this section of the store. In the end, the best solution for placing club packs will be based on the size of the store and whether the customer base prefers this type of packaging more often than non-bulk items.